Transylvanian villages: conservationism, but at what price? The interest in preservation and conservation of old, yet changed Saxon villages throughout Transylvania, often clashes with the interests of the present Gypsies and Romanians that live there today. In recent years, German and Saxon heritage in Transylvania has received much attention in the West. 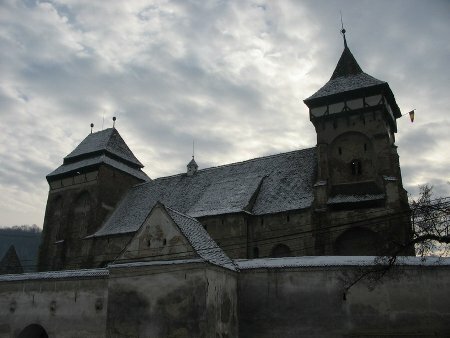 Media outlets such as openDemocracy or the Guardian have given voice to conservationist concerns regarding the future of the Transylvanian Saxon villages. The subject has also gained more recent prominence with Herta Müller (a Romanian German) winning the Nobel Prize for Literature and Klaus Johannis, the Saxon mayor of Sibiu, being touted temporarily as a Prime Ministerial candidate. In light of this increasing interest in the region and its German cultural heritage, it is necessary to offer a different view to what is often a romanticised image of these villages and to the role that conservationism can play. To do so, it is imperative to understand the historical development of the villages and the complexity of their current situation. Bartizan on the walls of the Transylvanian Saxon citadel in Cincsor, Romania. There has been a tendency to portray Saxon villages as the embodiment of 800 years of untouched tradition and architectural heritage. There are, however, several aspects pointing towards a different reading of history. First of all, the Saxon communities experienced around 500 years of instability during Tatar and Turkish raids. With the exception of the fortified churches and the villages' spinal layout (not grid-like), historical evidence suggests that very little remained of the original medieval structure of these settlements. It is only from the late eighteenth century that a period of stability brought about the current village fabric. Yet even in this period of stability, change and adaptation were constant and fundamental features. Materials, building methods, the effects of the extreme climate and fashion all contributed towards the changing appearance of these villages. The change from timber to masonry, and from mud-based plasters to lime in the nineteenth century helped shape further the new fashions in the design of the façades, which are now at the centre of the conservationist agenda. In the twentieth century, this was developed by the introduction of cement - the use of which is now frowned upon by prominent conservationist organisations such as the Mihai Eminescu Trust (MET), who advocate cement-free facades as the purist Saxon approach. Furthermore, due to the extreme continental climate -hot summers, cold winters - the plaster deteriorated rapidly and annual maintenance was required, which provided an opportunity for Saxons to respond to the latest decorative fashions. The oldest facades that we have seen date from the early nineteenth century, though the majority of façades date from the twentieth century with strong Jugendstil influences. It is thus clear that what we are looking at is not an authentic representation from the medieval period, but an expression of constant change and renewal. Moreover, the prominence of the date on these buildings indicates that being fashionable was also of great importance to the Saxons. Our research suggests that this process of change may have continued had political and economic upheavals from the 1930s on not intervened. Indeed, post-1990 a number of remaining and returning Saxons have changed their houses to reflect current architectural trends. The Transylvanian Saxon citadel of Valor Viilea in Romania. As for the wider context, portrayals of the Transylvanian Saxons are in somewhat skewed. They have been depicted as a "dislocated tribe" until a sudden mass exodus in 1990. In his article in the Guardian from 01st October 2009 ('The forgotten Saxon world that is part of Europe's modern heritage'), Simon Jenkins suggests precisely such a view of the 'forgotten' Saxons and proffers that the disappearance of Saxons to Germany was sudden and unexpected. However, even before World War Two, educational visits, trade, travel, and political contact with the German Lands was not uncommon. Moreover, the process of immigration to (West) Germany had already begun at the onset of the Cold War under the pretext of Familienzusammenführung (bringing families back together after the turmoil of World War Two). Under the Schmidt government, an agreement was reached in 1977 whereby approximately 11,000 - 12,000 Germans (Transylvanian Saxons and Banat Swabians) were allowed to leave the country annually in exchange for a set fee. In reality, the figure was higher than this, reflecting the Saxons' desire to leave the country, rather than Ceausescu (then Romania's dictator) 'getting rid' of them - as suggested by Jessica Douglas-Home in her openDemocracy article of 4th June 2002 ('Dream-parks and theme-parks'). Emigration then continued to gather pace towards the end of the Cold War. Whilst some claim that the year 1990 witnessed the sudden exodus of half a million Saxons, in reality the period between 1989 and 1992 was the culmination of an ongoing process, which saw around 200,000 Germans (again: Saxons and Swabians) leave the country. To be sure, these were dramatic processes, but in developing strategies for the future of these Saxons villages, it is crucial to understand the true nature of the changes that have occurred. What this demonstrates is that conservation practices are often based on an imposed memory of a romanticised past. What is being preserved in Saxon villages is typically a late-nineteenth, early twentieth century image of the villages, and more importantly it is an image as perceived by outsiders. This is in itself not a problem, as conservationism in Transylvania has had some positive impact. But one ought to be careful when mythologizing a past, as this can lead to problematic hierarchies of cultures in Transylvania as is the case today. Jenkins outlined this danger, yet fallen into this trap as well. Of course organisations that have pooled money into conserving and indeed rebuilding houses, streets, and churches are to be applauded for their efforts, but this is often done with the tacit acceptance that the vanishing culture of Saxons has a higher value than the culture and needs of the current communities of Romanians and Gypsies. The implication in all of this is that Gypsies (and to a lesser extent Romanians) are too unsophisticated, too culturally uneducated to be trusted with maintaining these villages. To be sure, money is needed in these villages, but this should not be made available on the condition of submitting to a different and diminishing culture. As tragic as the "collective suicide" of Transylvanian Saxons is, it is still imperative to strike the right balance between conserving this unique culture and acknowledging the needs of the current inhabitants. Whilst the Saxons' churches are certainly beautiful and historically absolutely worthwhile and important, is the money spent on projects such as restoring the small Saxon church in Floresti - one which nobody uses - really empowering local people, some of whom still live in abject conditions?